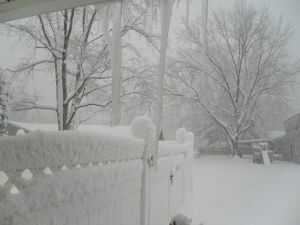 New York – Experts say many parts of the U.S. are in for a hell of a winter storm. The National Weather Service is using terms such as “life-threatening” and “historic” to describe the system ready to spread across the Northeast. The storm could dump up to 3 feet of snow in Boston and New York before it ends Tuesday, along with freezing rain and strong wind gusts possibly reaching hurricane level. Blizzard and winter storm warnings are up from New Jersey through Maine and into Canada. “We plan to cancel all flights Tuesday at Newark, LaGuardia and JFK, as well as Boston and Philadelphia,” said United Airlines Spokeswoman Mary Ryan. Other airlines were implementing similar measures. Check first if you’re flying into or out of the region. The Weather Service says whiteout conditions will make travel extremely dangerous in the entire affected area. Wind gusts in the New York City area could hit 65 mph. The blizzard warning is in effect from 1 p.m. Monday through Tuesday, with the worst conditions expected from late Monday evening through midday Tuesday. EASTERN MARYLAND AND DELAWARE INTO MAINE. YORK CITY AREA INTO SOUTHERN AND EASTERN NEW ENGLAND.